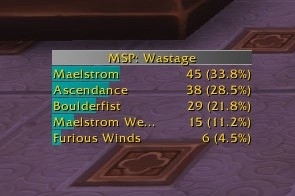 Koko MSP is a maelstrom power tracking addon for shaman. The intent is to provide a summary of your expected, actual and wasted MSP during combat. 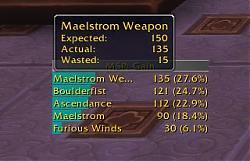 *Live stat GUI display (ie: during combat), which may be customized. *Data saving between sessions. Last 20 fights data per specialization is saved. *Skada plugin for MSP gain (theory not yet implemented). *Changing font sometimes does not update immediately.